Maybe they’re for some other experiment that isn’t relevant to this plot. PZ blathers on about how a whole civilization and environment was once in there but now there’s nothing left. Assistant says they need to notify the scientific community and we all know what that means – overly confidant defiant power hungry professor! 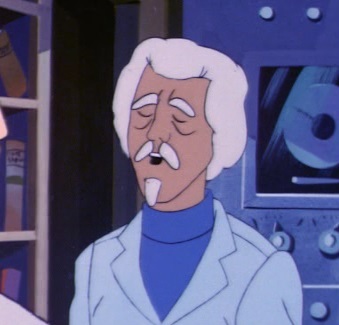 “With my teleport device, I will journey into the space vehicle and find….THE POWER!” and then blah blah about how it can ultimately help Earth. But hold up, he just casually throws it out there that he has a teleport device, like it’s as common as a keychain or bell bottoms. Maybe the albino leeches have something to do with his ability to teleport? Or thinking that he can? 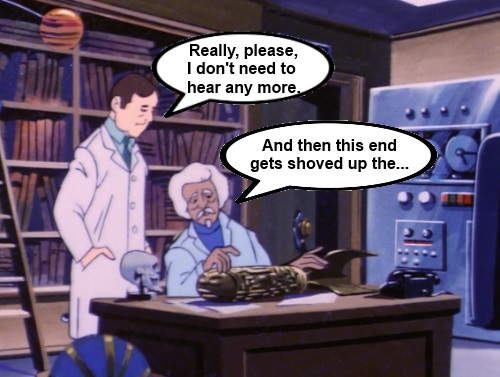 Anyway, PZ makes his assistant come with him, they “go missing,” and the Super Friends are alerted. “According to the mini bat computer, this teleporter has been activated.” – Batman, at the professor’s lab trying to find out where he went. Even Batman is unfazed by this teleporter, and he doesn’t even have a Bat Teleporter, which he would totally have if they were readily available. I don’t know what to call this thing but it really does look unpleasant. The Lobrat lives in a cave and takes Robin there. Batman and Wonder Woman manage to pry him loose and chase away the misunderstood rat-lobster abomination with “Bat Animal Repellent Spray,” which apparently doesn’t exclusively work on bats. They find the Professor and his assistant there as well. And that was enough to learn a lesson and they all went home. Of course not, you sillies. PZ doesn’t want to leave yet. He found an “electronic map” that will lead him to The Power (do you think that’s what this song is about?). He then somehow causes a cave in so that the others are trapped and he can find The Power. PZ presses a button on his electronic map and a recording explains that The Power is “evil,” and so unsafe, they buried it so that it could not harm the world with it’s wrath any longer. And by “buried,” it looks like about as deep as a cat buries a turd. 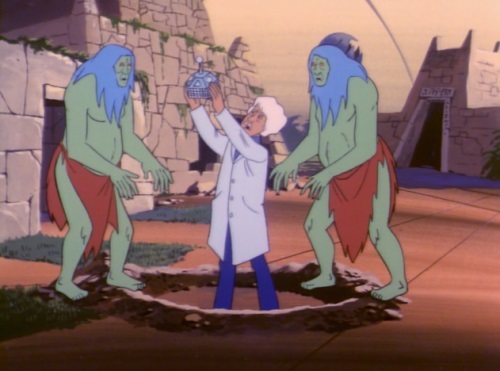 Way to hide the evil thing that must never be unearthed, alien race. It’s gettin’, it’s gettin’, it’s gettin’ kind of hectic. Unearthing The Power brings these guys out of the wood, or stonework. They look like some common ancestor split off and evolved the Oompa Loompas down one line and then these guys down the other. Evolution is truly amazing. They speak English, by the way. They say that because he uncovered The Power, he must pay. A nice, traditional choice. Gets the point across but is also comforting, like a scalding hot bowl of soup. As Robin, Batman, Wonder Woman, and the assistant look on quietly, Batman says he has a plan. Oh, boy. Yay. A Batman plan. Let me guess – everyone runs out there and they all randomly hope it works out. Yeah, the big plan is that Batman runs out, cuts PZ loose, and then Wonder Woman lassos the green people. I just think if you’re going to proclaim you have a plan, it should be more impressive than that. 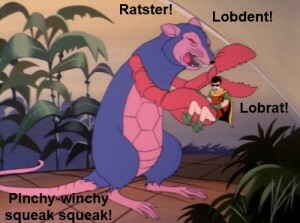 Like, if they rode in on a trio of Lobrats – that would be a plan. Finally, finally, The Professor has learned his lesson. Mutant awful lobster-rat monster takes you prisoner to eat later = no lesson learned. Mutant, reasonable bipedal beings dispensing justice via lava = leason learned. Good to know. Prof Z’s middle albino leeches appear to be coming from his nose. Being on the Smeath Star makes your legs grow really long and your waist get very tiny. The ratster walks on his front claws. Batman responds to danger by flinging his hand to his heart, like a big girl. The green people wear very large loin cloths. Holy inane; this one takes my breath away. It was all over the place. 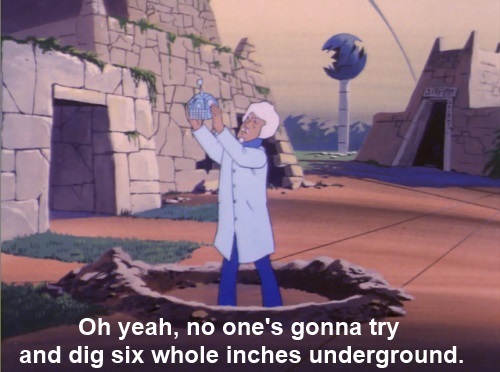 I thought the same thing about the ratster tracks – he must have been doing a handstand. the albino leeches have ants in their pants, they appear to come and go from his face in each scene. You gotta lava having the Superfriends back. I’ll go punch myself in the face for that one. good luck with the new neighbor. The leeches would move around like a lava lamp – sometimes they even actually looked like a mustache. 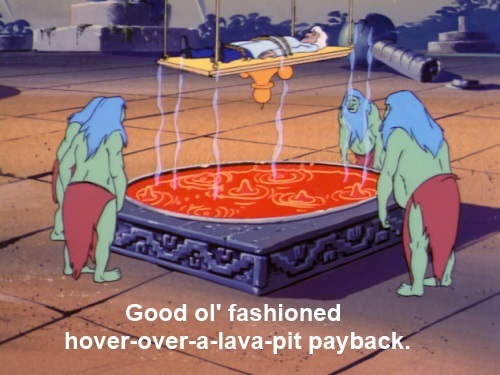 I don’t know if “making people pay” and “hanging them for a very long time over lava” are a good match. 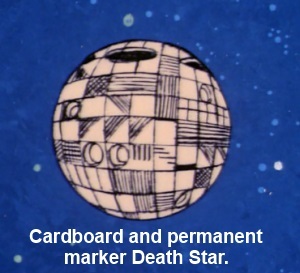 Perhaps this is why the cardboard death-star people never took over the world. Their planning needs some work. If they’d said, “We’re going to make you pay” and then fed him to a Lobrat, then I’d at least respect them more. That’s very red lava. It looks like tomato soup. Maybe they were planning on having him over for brunch and this was all a terrible misunderstanding. They were lowering him into the lava – ever so slowly, long enough for him to be saved, as is tradition. Holy Whereabouts is going to be my new catchphrase. Professor ZARKOFF?! How did he get back from the planet MONGO? Oh right, the teleporter thing. HA, I just had to look that up. I learned something new today – that I spell Zarkoff slightly different than Flash Gordon. I’m sorry. I did think of it when I wrote about the leeches because who wouldn’t – if you’ve seen it you never forget it. 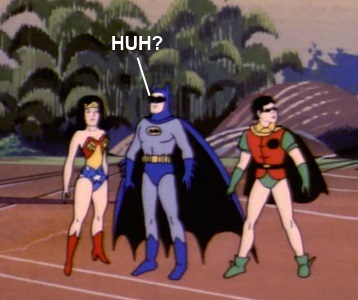 I hate it when the animator suddenly forgets what Batman’s costume looks like. But the Lobrat is kind of cute, in a mutant homicidal way. I went to my local pet store and asked if they had any Lobrats and they said no such thing exists. 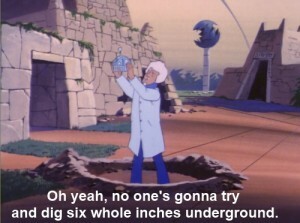 I’m starting to think that maybe these Super Friends writers are making some of this stuff up. Maybe they have them under “Pinchy WInchy Squeak Squeak” which is their proper scientific species name.